I’ve had the opportunity to experience the best of living, working and playing in Saskatchewan for one whole year. Here are my top five unexpected travel moments. 1. 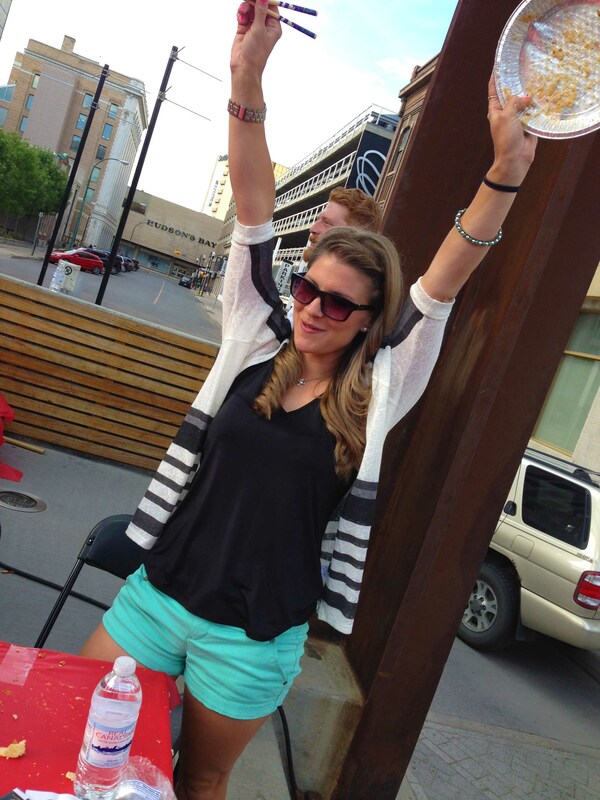 Winning a pie-eating contest It all began with a Twitter conversation I misunderstood. I thought I was judging a pie-making contest. I was actually agreeing to participate in a celebrity pie-eating contest. Realizing my mistake only a day before Regina’s Night Market Under the Stars, I started thinking strategy. I was nervous and prepared to do terrible. 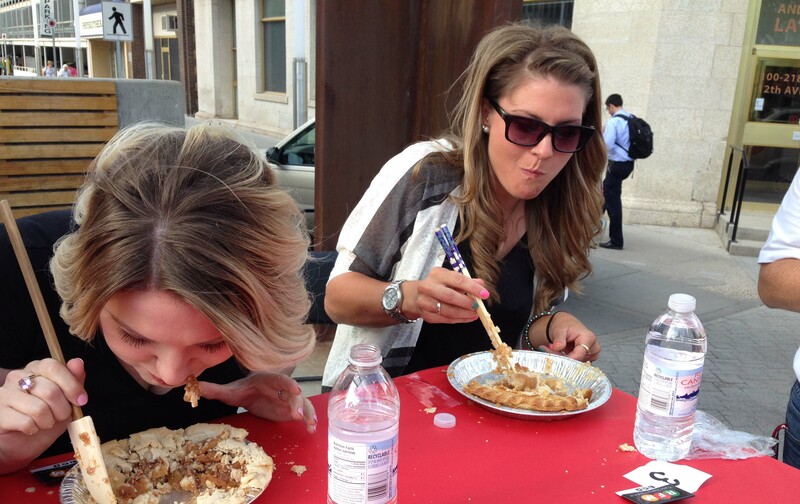 Adding to the challenge of consuming an entire pie was doing it with only a set of chopsticks. That’s why it was so surprising when I won the contest! I must admit, I couldn’t have done it without the wonderful help from a few members of the Regina Downtown Team. 2. A buffet to-go in Meath Park Originally planned to be a half-day hangout with Trevor Gowen from Power 99 music station in Prince Albert turned into an epic full-day adventure. After exploring La Colle Falls, we crossed the Cecil Ferry and finished the evening with sunset in a tandem kayak on the water at Hanging Hearts Lake in Prince Albert National Park. Running a little behind schedule that afternoon, we decided our quickest option was to visit Station Grill in Meath Park for takeaway buffet. 3. Riding Saskatchewan’s railways My favourite days were ones with free time in my schedule to explore, which is how I ended up in Shaunavon for a night on my two-week tour of Southern Saskatchewan. While dining at Harvest Eatery and Fresh Market, I met a crew of railroad enthusiasts traveling Saskatchewan by motor railcar. Originally used by the railroads to inspect the many miles of track for defects and track maintenance, the jiggers are now used for recreation. 4. Snowy hot dog roast in Northern Saskatchewan In La Ronge for the Don Allen Saskaloppet, I extended my stay an extra night for a day of snowmobiling to Nistowiak Falls with the Watt family. Saskatchewan hospitality, one of the highest waterfalls in the province and a hot dog roast in the boreal forest made this day one of my favourites. 5. Dog sledding Northern Saskatchewan During the same trip to La Ronge, I had the opportunity to learn how to mush. It’s an activity that has been on my bucket list since I was a teenager. I was excited to not only go for a ride, but to harness and drive my own team of three Alaskan huskies through the trees and lakes of northern Saskatchewan.